A treasure chest of memories. A hideaway for heirlooms. A niche toy hive. 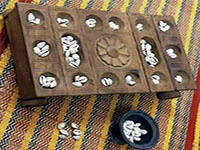 Kavade is an endeavour to revive traditional games… board games that are on the brink of extinction. 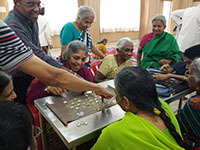 Housing a range of Indian and international games, Kavade is a one-of-a-kind store in Bengaluru that brings families and generations together, over simple pastime pleasures. In a time when devices are set to take over lives, Kavade is an attempt to depart from ‘tech’ gaming, to celebrate table-top gaming. It is a take on slow down and wind down, sit back and throwback. Kavade works with artisans and self-help groups across the country, to bring together pieces and portions of nostalgia. All board games, dice and accessories are made from a variation of natural materials. From classic and unique board games to traditional handicrafts, Kavade has carefully curated an array of collectibles. An exploratory space, a board game cafe, a party venue, a place for conversation and laughter, Attic is a terrace top with a difference. Kavade organizes board game immersions, workshops, and tournaments for schools, institutes, offices, and communities.